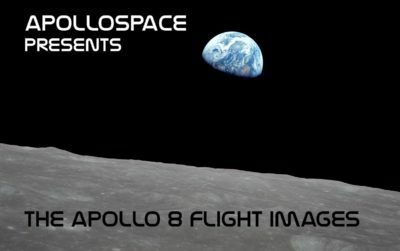 Apollospace® proudly presents the most comprehensive collection of fully restored and enhanced Apollo 8 flight images at the highest quality and resolution available! Apollo 8, the second manned Apollo mission and the first to venture to the moon, celebrates its 50th Anniversary December 21-27, 2018. 866 high resolution flight images from the historic Apollo 8 Mission – every image photographed by astronauts during this historic mission! 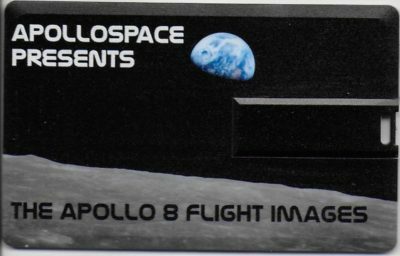 This special commemorative Apollo 8 50th Anniversary USB flash drive contains the complete catalog of every photograph taken by the Apollo 8 astronauts during this historic mission – fully restored and enhanced at the highest quality and resolution available! That’s enough to fill 3 DVDS! At 5200 pixels, the Apollo 8 flight images on this USB are up to 70% larger than partially restored and corrected counterparts available online and on other commercially available media, which generally measure only up to 3000 pixels each, are only a few megabytes in size (if that), and have not been fully restored, corrected and cleaned. 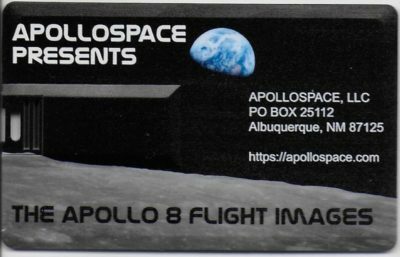 Each and every image on The Apollo 8 Flight Images USB has been painstakingly cropped and corrected for color, tone, and contrast and cleaned of blemishes including dust, hairs, scan lines, emulsion spots, streaks, scratches, stray reflections, and other flaws. In December 1968, a year marred by division and pain, human beings ventured farther out than ever before. The crew of Frank Borman, Jim Lovell, and Bill Anders became the first human beings to see the entire Earth, the lunar farside, and the first Earthrise. This short film uses the highest resolution, fully restored Apollo 8 photographs accompanied by contemporaneous radio transmission descriptions from the Apollo 8 crew. Apollo 8: The Earth From Here from Apollospace on Vimeo. Each JPEG image on this commemorative USB collection measures 5200 x 5200 pixels at 300 dpi. The individual image files on this USB are huge – averaging approximately 12 megabytes in size each. At 5200 pixels, the Apollo 8 flight images on this USB are up to 70% larger than partially restored and corrected counterparts available online and on other commercially available media, which generally measure only up to 3000 pixels each, are only a few megabytes in size (if that), and have not been fully corrected and cleaned.